I have worked with Heart Rate Monitors (HRMs) and other Electronic Training Partners (ETPs) for close to twenty years and in multiple sports for a wide range of goals. Needless to say I have picked up a few valuable lessons along the way. It makes sense, to me at least, to pass on along this insight so you can understand where I am coming from when doing product reviews. Growing up my parents had plenty of valuable lessons to pass along. I had a knack for dismissing their advice and making the same mistakes on my own. Once again with the same consequences. If only I had been able to tell my ego to take a hike. I could have actually listened, and learned and I would be better off today. There is a good chance most of you are more intelligent than myself, so do the smart thing. Read on! Learn from my mistakes. Save yourself time, money, and frustration. A quick disclaimer before moving on. There are no affiliate links or paid advertising in this post. These are products I have purchased over the years and my experiences and insights using them day in and out for over a decade. I got my first heart rate monitor in college while rowing crew. It was a Polar A5. A standard wrist unit and chest strap that displayed some simple metrics. The feature I used most being “time spent in target zone”. You could set a HR range. Basically the intensity you wanted to train at and the unit would quantify how well you were sticking to your goal for the workout. This was a great unit to start out on. Great when it worked. I have a skinny frame and back then the chest strap was made of stiff plastic that caused the sensors to connect poorly with my skinny chest. Most HRM track the electrical current given off by the heart. Moisture between the HR strap and your skin makes a good environment for transferring these electrical signals. Even when I was sweating heavily I could have problems getting a good reading. Luckily the hardware has come a long way. First women had the upper hand being able to tuck the strap underneath a sports bra. Some companies even sell sports bras with the HR strap built in. This ensured the HR strap was well compressed against the skin. Then companies figured out fabric based HR straps. These are softer material which conform much better to a variety of body types including my bony rib cage. Hard plastic strap would have trouble conforming to my skinny chest. Erratic feedback until sweating moderately. No alarm to let me know when I was out of the HR zone. Had to look at the watch constantly. Unable to take splits, so no interval specific data. Unable to change battery in HR strap. Would have to buy new strap when dead. Not sport specific. Had a bruise on my chest from hitting the strap with the oar handle. 1. HR information gives insight into how your body works. 2. Recording and comparing HR information by hand is time consuming. 3. There are lots of variables that can affect HR which are not part of your workout such as: what you ate that morning, quality of sleep, stress level, etc. After getting out of school I gravitated away from crew to triathlon. The A5 still worked great for basic HR information, but I was eager for more detailed feedback. The A5 did not do splits and I was getting tired of writing down my stats after each training session. I kept losing the scraps of paper I would keep notes on.I also wanted more data from my bike workouts. Like speed and cadence numbers to match up with the HR info. Polar was then offering its desktop based software with certain HRMs, but it required upgrading to a more expensive model. I took the jump and went with the Polar S720i for almost three times the cost of the A5. It was a big jump, but gave me a whole new world of feedback. It could store data on more intervals than I could complete in one session. It would beep encouragingly at me when I feel off the wagon during a workout. I could use it in the pool. It would collect my bike stats and download them all to my computer. It would download when the infrared USB device would work. No Wifi or Bluetooth then. The S720i introduced me to the trouble shooting headaches and additional expense of add-ons. 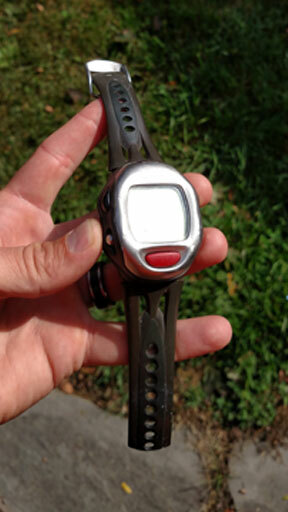 These were supplemental gadgets purchased separately from the HRM, such as the bike speed sensor and cadence sensor. The watch would give you information about the bike, but only if you bought the additional sensors. They were wireless, but separate units in those days. As mentioned previously you could download your workout information from the watch, but only if you purchased the additional USB connector separately. This must still be a great sales strategy as most companies continue to stick with offering add-ons for mid and high end HRMs and GPS units. From the consumer side it allows you to add on additional features for less than buying a whole new HRM unit from a higher tier of features. Not only because of the cost of the original unit, but along with the add-ons, the S720i became my biggest fitness investment at the time. I was willing to shell out the dough since it could provide me with more insight into my training habits and progress, but it sure was a lot of money for me at the time. I used this unit for about a year before the battery ran out. I tried to change it myself, but re-installed the back cover incorrectly which led to water leaking in and frying it dead. If the device is not expressly setup for user maintenance send it to the manufacturer for fixing. Even if the manual does walk you through it this may void the warranty in some cases. Check first! Durable – except when maintained by yours truly. Audible out of zone alarm. Detailed HR data for splits. Good software for storing and viewing workout data. VO2 estimation feature for tracking progress – who knows how accurate it really was, but a quantifiable measure of progression. Not able to change the battery myself without destroying the device. USB transfer device did not always work well with my computer. Ate up time getting it to work. Wireless accessory range was extremely tight, sometimes dropping signals. Increased cost of additional add-on devices. 1. Splits creates a clear way to separate important data. 2. It is much easier to compile and analyze workout data with software. 3. It can be very expensive to fiddle with hardware, granted you want device to work once said fiddling has ceased. 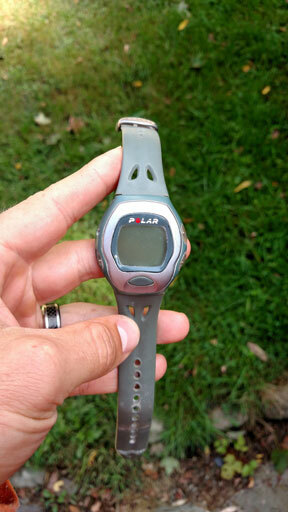 With the Polar fried worse than KFC I had a decision to make: Buy another Polar and be able to continue using my paid for proprietary add-ons, or switch to Garmin and get the convenience of GPS tracking on my wrist? I decided on the latter. Mainly because the cost of a Garmin Forerunner 201 was less than re-purchasing a S720. The only functionality I would lose would be cadence and I could decide to purchase a Garmin accessory should life be too hard to bare without knowing my RPMs. For those who are somehow not familiar with the term GPS, I’m surprised you have read this far. High five! Garmin and Polar use different file types. 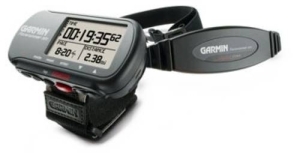 Garmin’s software will not import my year’s worth of Polar workout files. FYI, trying to compare workouts across two different software platforms is cumbersome and NOT time effective. Large screen to display lots of metrics in REAL TIME. Data saved without spending time estimating on Google Pedometer. Speed and Distance cycling info without extra bike accessory. Garmin software not as user friendly as Polar. Garmin software does not work with Polar files. Spotty GPS pickup in woods. Not waterproof (at that time). 1. Newer does not always equal better. 3. Rechargeable battery = more chances for the battery to die mid workout = no workout data. When I moved back to the East Coast from Colorado I quickly found the Forerunner 201 to have trouble in the denser cityscape. The 201 was early GPS technology and Garmin, and others, have since come a long way in improving the tech to provide more dependable data in urban settings. At the time I was not ready to wait for it to get up to speed. I shipped it off to my father to use in the wide open skies of the West. At the time I was also stepping back from triathlon and mostly running distance. Philadelphia had a great path along the Schuylkill River that had regular distance markings and I also had access to the UPenn track. Using these and a standard Timex Ironman watch I trained for close to a year without heart rate. I focused strictly on pace and perceived effort. This was an enlightened period. Getting back to basics put a spotlight on the dark side of training with an electronic partner. It made me realize I had been basing my fitness aspirations on the data, rather than on my feelings, dreams and personal motivations. I had been so geared up and invested in my gadgets and the processes of collecting data that I had lost touch with myself and what I believed I could do. What I believed I could accomplish or wanted to accomplish had been determined by the device on my wrist. For years the data guided my training. It told me when to go hard. How hard. How long. When to rest. For how long. I was deferring to devices rather than paying attention to my own body. My dreams and deep sources of motivation had been neglected for data. The process was backwards. The HRM was in the driver’s seat. My good old Timex got me back behind the wheel. It took away all the extraneous data. It didn’t need charging. It gave me duration, splits and self-awareness. I could always count on it and I began dreaming again of what I could achieve. Don’t get me wrong there were plenty of times when I wondered if my HR was matching up with my perceived exertion, but it was liberating not to even have that option. To be forced to trust in myself. It got the training process back in a healthy sequence. Set a goal I am motivated to pursue. Layout the steps that will get me there. Does my device support me in pursuing my goal? Focus remains on big picture training goals. 2. More features is not better if they compromise your ability to complete high quality sessions. 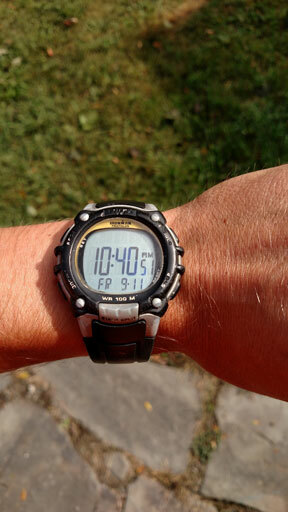 For a number of years after the Timex watch I stuck with the Garmin FR 60. I gravitated back into triathlon. Having the big picture training sequence well established I felt comfortable bring more data back into the mix. My priorities align first and foremost with a unit that provides easy access to splits and duration. That is it! If the unit was able to provide pre-designed interval workouts, or speed, distance, HR and cadence data for a variety of sports inside, or out, fantastic. Not necessary, but great if it helps me focus on the big picture and the features are dependable. Think of an HRM just like you would of a person. You want someone you can depend on to get out of bed and meet you on the track. Someone who will show up, do the work with you, make the journey better and help you get where you want to go. Sometimes training partners don’t get up in the morning (shout out to Ray!) and you forgive them because of the value they have added to your journey. If it becomes a habit, it may be time for a new partner. My Timex reminded me a valuable lesson. Improvement is a progression that starts with the basics. Sounds like something my parents taught me along the way. Fitness is NOT dependent on tech. Integrating an all knowing device into your training can make it feel that way. Tech should make achieving your fitness goals more enjoyable, easier, or more effective. Stick to 1-3 features you cannot live without and make sure your device does these WELL. Data benefits your fitness best when you collect it, review it, and try to understand it. Remember lesson 1, you can improve without a HRM. Tech will choose to not work at the most inopportune times. There are many variables outside your control which affect how well tech works. Tech only works when the batteries are charged. Tech is like therapy; use it to better understand yourself, then ween yourself off it. Thanks so much for reading the TGBtraining blog! Have a question about the article? Go ahead and ask it in the comments below and I will be sure to get you an answer. LIKE WHAT YOU'VE READ? PLEASE SHARE IT!